Sunseeker Yacht Broker - Sunseeker Yachts for Sale : Atlantic Yacht & Ship, Inc.
Search our Used Sunseeker Yachts for Sale database now! In the 1970’s, Robert Braithwaite, a British boat salesman working for Poole Power Boats, purchased the boat mold from American boat builder, Owens. This purchase marked the beginning of the entrance of Poole Power Boats into the boat building world. The company began with 17 and 23 footers and after collaborating with Designer Don Shead to develop newly designed deep-V hulls, the company developed their collection and attained elite status. 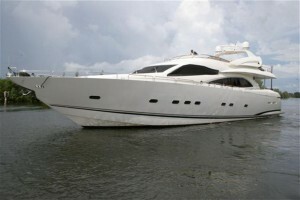 With this status came the official change of the company name to Sunseeker International Yachts. The Sunseeker consistent standard of perfect balance between performance and luxury has carried it to heights in its nautical niche. Sunseeker also sets itself apart from competition with their development of jet propulsion systems in leisure crafts. They extended their conception of yachters to families, including storage for tenders and toys in their family-sized cruiser, a feature that is now standard in modern motor yachts. Their collection of vessels spans from the 34’ Sportfisher to their tri-deck 155 mega yacht, which is currently in build. Over the years, Sunseeker has been able to grow and evolve because of its commitment to continual development. Because of this consistent progression and improvement, Sunseeker has been the builder to set the standard. Constant research into new state of the art methods and materials keeps Sunseeker ahead in marine design and technology. Since 1999, Sunseeker yachts have made appearances in every James Bond Movie. No doubt, this is due to the superior design and performance of their vessels. Sunseeker also takes pride in the element of hand crafting involved in the building of their vessels. Of course, being a technological pioneer, there are automated elements to the construction of their yachts, but the introduction of the human factor adds quality to their already valuable products. Find more information on Sunseeker Yachts History.